A happy family story; Sidney Beldam of the Machine Gun Corps was severely injured on 28th November 1918. 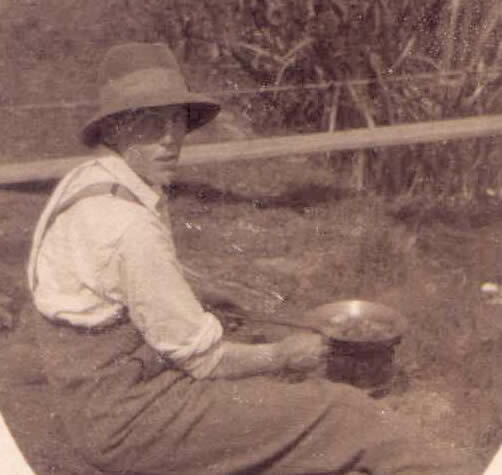 After several operations he made an excellent recovery and worked for many years as chauffeur to Sir Harold Gillies. 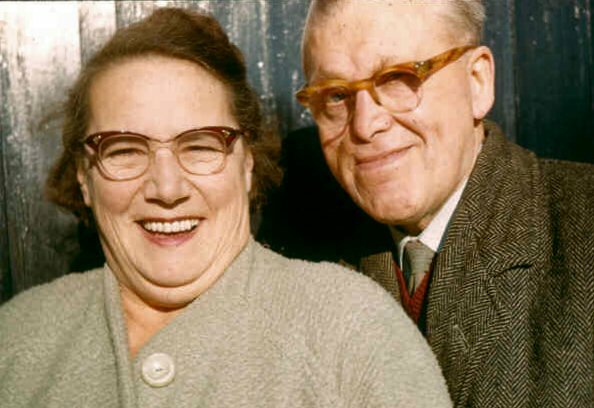 He is pictured on the right with his wife in 1965. We receive many requests for information about military personnel who were injured in the Great War. 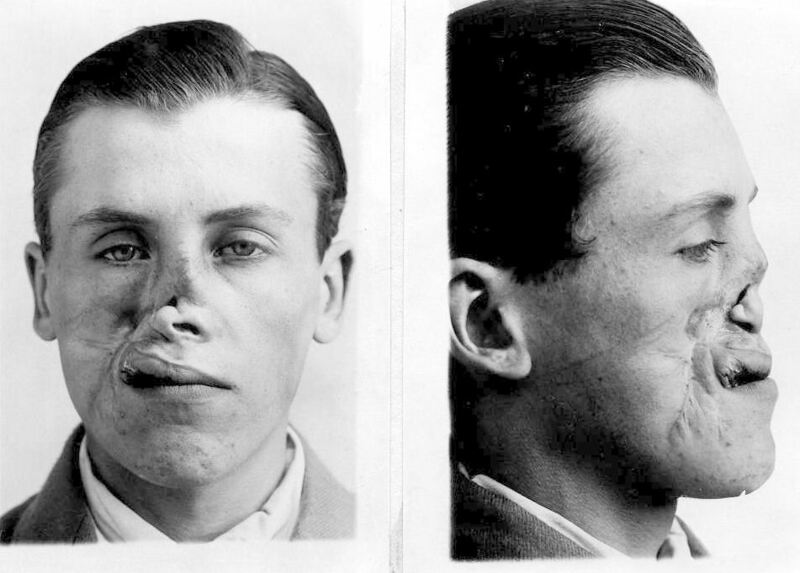 There are extant notes of somewhat over half of those treated for facial injuries between 1916 and 1925 at Aldershot or Sidcup. You can examine the database (Excel spreadsheeet for Windows) by clicking here. I have added some first names extracted from the Medal Roll (see below); the notes only carry initials. There are some transcription errors, but where added information from the medal Roll or other sources is inexact, the detail has been added in brackets. I am most grateful to the many people who have given me information about their relatives treated at Sidcup. I now have "back stories" for over 90 patients. Thes have changed my perception of the effects of facial disfigurement on psychological wellbeing; I will in due course add further stories underpinning my hypothesis that what we now know as PTSD comes more from war experience than disfigurement per se. I am grateful to Victoria Passau of the Auckland War Memorial Museum for going through the New Zealand records, and adding first names and cross-references to the Cenotaph database. The reference numbers for the latter have now been appended. Online Cenotaph data in the soldier profiles was kindly provided by the Auckland War Memorial Museum Tamaki Paenga Hira is licensed under a Creative Commons Attribution 4.0 International License . The British Section notes have been digitised by Findmypast.com and more details on individual soldiers, in particular first names, are available through their website. Recent discovery of the Canadian Section Admissions book has enabled me to expand considerably the Canadian data originally derived from a small number of casenotes in the British Section and a shipping list of photographs and X-rays also in the National Archives of Canada.. However there are Canadians treated at Sidcup who do not appear in the book; officers are excluded, some service numbers (and names) have been incorrectly entered. As far as possible I have cross-referenced the book entries with the Canadian National Archive database of Attestation papers. I have removed likely duplicate names but there are now 485 entries. Where a service number is shown the information for the soldier is confirmed either in the admissions book or because the information was given in notes from the British Section, which cared for a number of Canadians. If you are sure that your relative from WW1 was treated at Sidcup please contact us anyway, as we are keen to fill in the gaps. This applies particularly to the Canadian patients. We hold the New Zealand casenotes in their entirety (although fragments remain in the Hocken Library in Otago University, Dunedin). The Australian notes are in the Royal Australasian College of Surgeons in Melbourne, from which our list derives. A visit to the National Archives at Kew is always a rewarding experience. The UK National Archives are the start point for all UK soldiers. Many of the British "other ranks" files were lost or damaged in WW2, so the chance of finding a file is poor; however officers' files survived intact and may be copied. 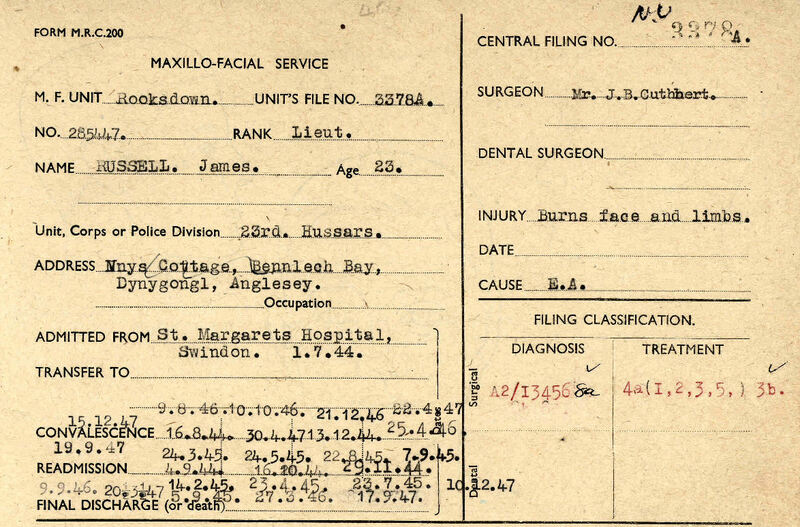 Also the Medal Rolls are now on line.In addition the file may contain (or you may know) your relative's injury date, and by consulting the War Diary for their unit you may be able to piece together the story of their battle experience. This is more difficult for the generic arms (eg ASC, engineers, artillery, Machine Gun Corps, RFC/RAF) but some idea may be obtained if you can discover which Advance dressing Station (ADS) or Casualty Clearing Station (CCS) they passed through. There is a location list of all CCS, so the rough geography can be deduced. For infantry regiments it is usually possible to pin down an exact position, especially for the Somme and Passchendaele campaigns on which day by day accounts have been published. You may be able to find a copy of a file on the Ancestry.co.uk website, which has linked up with the National Archives to digitise the service files. However you may find that being too specific in your search will return no results. Also you need to remember that a large part of the service and pension record collection was damaged or destroyed in a WW2 bombing raid, so it is possible that you will come to a dead end. The Western Front Association have acquired a full set of soldiers' details used for pension calculations. These include addresses and names of next of kin. As yet these have not been digitised but it may be worth enquiring of the WFA whether a paper copy is accessible. For English soldiers you may be able to trace origins by using the recently released 1911 National Census. This is time-consuming, and not free, but may be very rewarding. Military files in other national archive collections may be consulted. The Australian and Canadian records are all on line. Those from New Zealand may be ordered from the NZ archives, but there are charges for copying. McCarthy C. The Somme . The Day by Day Account. The Royal College of Surgeons now possesses the notes of 3500 patients treated from 1942 to 1960 at Rooksdown Hospital, Basingstoke. A large proportion of these are civilian records but some military notes survive. Due to regulations on the disclosure of patient notes that were held within the National Health Service in 1960 it is not possible to provide public access to the database of names. However, relatives may apply to the Royal College of Surgeons for information. The Bundesarchiv - Militaerarchiv may also be helpful. Specific regimental archives are listed below.